Imagine a new controller that takes your PS4 gaming to the Next level. Imagine you can access PS4's unveiled capabilities and change the rules! Move quicker, fire faster and reach further… Become UNBEATABLE! The REVOLUTION Pro Controller is made for you ! Designed & developed with professional eSports players, the REVOLUTION Pro Controller is going to leverage the eSports competition at a new level. Fully customisable and unmatched precision, the REVOLUTION Pro Controller will offer gamers the possibility to setup their controller for each game and be more efficient in competition. Comfortable for the hands, pleasing for the eyes, but tough and durable when it comes down to the competition – these were the requirements we set when we started to design the Revolution Pro Controller.The rubber-coated surface allows for a tactile and comfortable controller. The innovative convex right analogue stick is at the very core of the REVOLUTION Pro Controller design.Its amplitude and height are enhanced to allow for an incredibly high degree of accuracy. Its larger head is to ensure precise movement even during the most intensive gaming sessions. It has been increased in size to ensure precise movement even when the game is at dramatic climax. The analogue stick is also encircled by a backlight halo LED, which indicates which of the two controller modes the player is using. The dead-band and response curve of the right stick can be also be adjusted using the PC companion app. The smaller left analogue stick, with its concave head, gives the player the grip and confidence they need during competitive gameplay. The D-pad features 4 extra large wings, to make sure the player never loses control while switching between Left joystick and D-pad. The angled wings allow for a quick orientation for the fingers without the need to take the eyes off the screen. This 8-Way D-PAD is perfect for any fighting game and will give you a real advantage in competition. The REVOLUTION Pro Controller includes all the classic features of a controller along with additional DUALSHOCK®4 controls including the innovative touch pad and SHARE button, and a 3.5mm headset jack. Both the triggers and the shoulder buttons are profiled. This way they integrate seamlessly into the overall design and allow for rapid responses.Players can also adjust the dead-band and sensitivity of each trigger via the PC companion app. 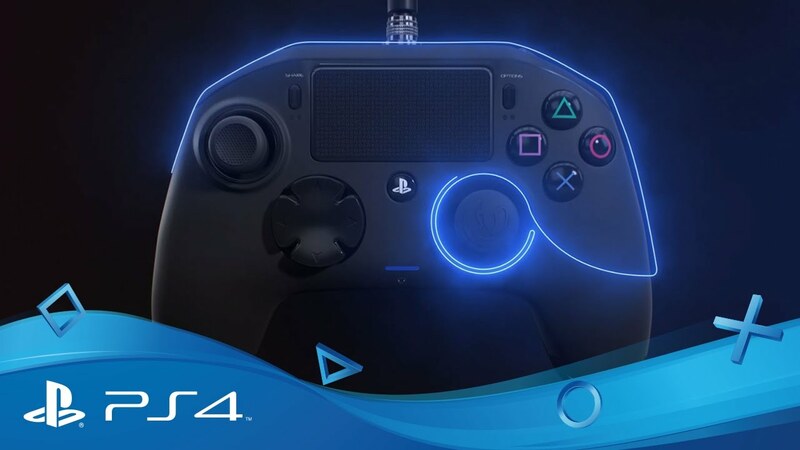 The Revolution Pro Controller comes equipped with a 3m cable which connects directly to a free USB port on any PlayStation®4 system, including PS4™ Pro. During his lifetime a controller needs to withstand some serious mistreatments. The REVOLUTION Pro Controller is built in a way which will ensure a long lifetime, and the detachable braided cable achieves this. By controlling gameplay via the 3m USB braided cable, players can enjoy minimal latency - ideal in a tournament environment where every second counts. For transport the cable can be removed and the high quality metal screw plug ensures a secure fit and hard wearing connection. Worked closely with professional gamers, the Revolution Pro Controller also features 4 buttons on the back of the controller. These give the player extra options to map controls onto the device, since recent games can ask for more than just the regular control layout. Those shortcuts will give you a complete advantage on your competitor as they are quickly and securely accessible. As much as the REVOLUTION Pro Controller is about innovative and elegant design, it is also about giving players a weapon which is tailored to their individual needs. That’s why adding an adjustable weight system has been one of the major design features which we’ve put on the feature list from the start of the project.Two weight compartments with chambers for two weights each are housed in the grips of the controller. This allows the user to adjust the weight of the controller using the six extra weights provided.